When you lose the opening six games in a tournament and are virtually out of it, questions do arise and they are bound to be answered by the responsible people. 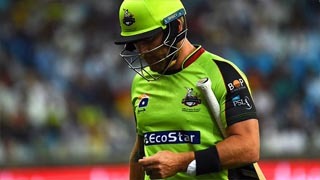 Lahore Qalandars, one of the most expensive teams in PSL, representing the Provincial Capital and boasts the best T20 players around is tasting the same fate in the ongoing third edition of the Pakistan Super League. They have lost the opening six games, where they are bound to play four more and are out of the contention to play the playoffs. They are the only team not to have qualified for the playoff’s in PSL, exception being Multan Sultans who are playing their first edition but they are still in the race to qualify. Lahore’s performance in the past two editions was also dissatisfying, but this time they achieved some new lows by losing six consecutive games, they have lost nine games in a row if you take their streak from the past season. Well, it was horrible show by them and as a result Brendon McCullum, the captain of the team, has suggested to give up the captaincy as it may change the fortunes of the team and they may start winning. But was it all the Baz’s fault? We know McCullum’s approach is going and expressing himself and his team follows his suit, we know McCullum has led New Zealand by the same approach and changed the mindset of NewZealand cricket and he was very successful with it. But same is not the case when he has led Lahore Qalandars in the two seasons and he has rarely had any success. We have seen Lahore Qalandars smashing their way to batting collapses and losing the games they should have won, had they applied some brain with the brawn. Sunil Narine, Fakhar Zaman and Brendon McCullum, these three combined and it is the most explosive top order for any team in PSL. But the problem is whenever they get out there is no one else who can take the game a little further and wait for the final overs to launch an attack, but they try to carry on with the momentum of the opening three and then they collapse like you have never seen before. They come, try to smash every ball and get out. We have seen Lahore Qalandars making 60 for 1 or 2 in the first 6 overs but then folding for around 120 and not even completing their batting quota of 20 overs. It has become their routine now and will take some effort changing. Disheartened or may be tired of it, McCullum has offered to leave captaincy but that is never a good option in the mid of a tournament. McCullum should carry on with the captaincy but try to bring some fresh blood in the team’s middle order to give stability to it. Ask the team to get to a par score of 150 and they always had a very good bowling attack with the likes of Sunil Narine, Yasir Shah and Mustafizur Rehman to defend that score. Agha Salman and Antoine Devcich may be good options to be introduced in the batting order and hopefully the fate will change.